On this Garage Epoxy Floor Project we started by removing the existing flooring of an adhesive backed checker board linoleum, we started out prying and pulling at it but it was so brittle it was breaking off in small pieces, so I pulled out our handy air powered scraping tool, and it pealed it up like a hot knife would cut through butta! !……….more info under the Video. Once all the tile was up we proceeded to grind the entire floor with our 95% dustless vacuum system this step was all completed within 2 days, we came back in the 3rd day and started mixing our Tan colored Epoxy resin, once the epoxy was all down, we moved to the next step of the process. The next step was to toss on my spiked shoes quickly and grab my bucket of vinyl chips and get out there on the freshly laid down epoxy and toss my chips in the air (as you may have seen in the Video above). once all the chips were thrown on top at 100% coverage, I had to take the rest of the day off, and resume the next day. 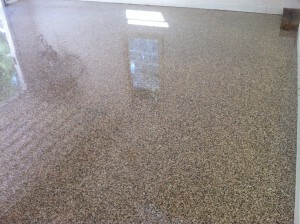 The last day, we started by scraping and brooming off any lose vinyl chips, clean it up real well. Then proceed to the mixing of the clear epoxy resin, once mixing starts its game on again!! 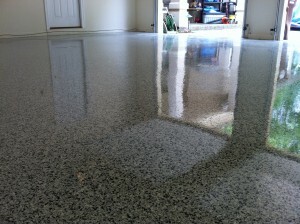 Once the Clear Epoxy was on, it was clean up time, because this Epoxy Garage Floor Project in Four Season Missouri was Complete! We Started this Residential Home in Porto Cima Sunrise Beach, MO Garage Floor Project with a Pretty Fresh Surface to work with, it had some paint, some oil, but for the most part was pretty nice to work with. We came in and Prepped the floor first by doing some grinding, removing the oil and paint/drywall mud, but once that was done, it was time to prep the walls with concrete tape. Once we had everything prepped it was time for the Colored Epoxy which was a Med Grey color, once that was laid out I got my spiked shoes on and went out on the nice smooth like glass colored surface and proceeded to toss the chips up to cover the epoxy at a rate of 100%. Last step was to lay on the clear epoxy to lock the base coats and vinyl chips in place. Pull out tape and clean up!